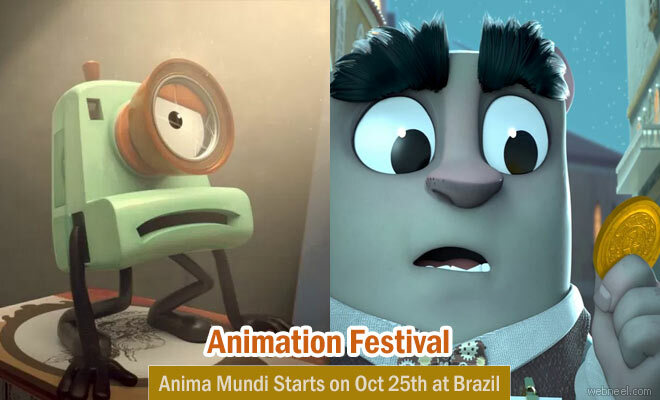 Brazil welcomes all artists around the world for it's International Animation Festival - Anima Mundi which is all set to happen from October 25th - 30th at Rio, Brazil. Every year the animation festival happens in Rio and Sao Paulo. This year it's all set to happen in Sao Paulo from November 2nd - November 6th, 2016. During the 23 years of festival, atleast 9000 films were exhibited from 70 different countries and more than 1 million people have participated in the fest. Atleast 400 short animation films will be played along with lectures and meetings. The meetings are all set to take place in Modern Art Museum, Cine Odeon, Cultural Center of the Federal Court, the Library Culture, Maison de France, the Future Hi (Ipanema), the CRAB, the Cultural BNDES, the City of the Arts, in Barra da Tijuca and the Cine Point in Guadeloupe. The selected 400 films are from 45 different countries like the United States, Canada, the Netherlands, Germany, Russia, Portugal, Iran, Argentina, Italy, Chile, Mozambique, Japan, Greece, Turkey and Australia. Anima Mundi was first started in 1993 and during that year 144 films were exhibited and had 7000 people visiting the festival. Did you know that the Anima Mundi winners are qualified to compete for the Oscars in the animation category.